South Africa's public broadcaster has said it refused to broadcast a campaign message from the Economic Freedom Front (EFF) as it incited violence. The South African Broadcasting Corporation (SABC) denied that it was banned because it came from the EFF. The advert calls for people to "destroy e-Tolls", a controversial new road tolling system. 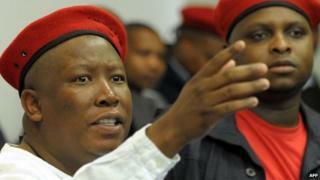 The EFF, set up by ex-ANC Youth League leader Julius Malema, is contesting an election for the first time next month. Mr Malema likened the SABC's actions to those used by the apartheid government, which censored messages with anti-government sentiment. Toured mines following the shooting of 34 miners in Marikana by police in August 2012, urging workers to make the sector "ungovernable"
"Once you suppress the people contesting elections it means you not ready to give us free and fair elections because unfair coverage leads to unfair elections," he told reporters in Johannesburg. However, SABC spokesman Kaiser Kganyago said it was to do with regulations, not politics. "They submitted it, we looked at it, and we found that we couldn't put it on air," the South African Press Association news agency quotes him as saying. "The EFF, like any other political party, signed the code of conduct with the IEC [Independent Election Commission] that says it will not incite violence.... [the advert] goes against the code." The SABC has reportedly written to the EFF telling them to amend the advert, but the party has refused to do so. Earlier this month, the SABC also rejected an advert from the Democratic Alliance (DA), the country's main opposition party, saying it used language that promoted violence and amounted to a "personal attack" against President Jacob Zuma. But it was eventually aired after the Independent Communications Authority of SA's (Icasa) complaints and compliance committee ruled in the party's favour. EFF spokesperson Mbuyiseni Ndlovu said their party had also lodged an Icasa complaint. Its advert, which has been posted on YouTube, starts with a widow of one of the striking miners killed by police in August 2012 in what is called the Marikana massacre. It is followed by a message from Mr Malema asking South Africans to vote against the "empty promises of the last 20 years", then several slogans appear across the screen, one of which says: "Destroy e-tolls physically!" Mr Malema was once a close ally of Mr Zuma but was expelled from the governing African National Congress (ANC) in 2012 for sowing divisions in the party. The BBC's Pumza Fihlani in Johannesburg says opposition parties have in the past accused the SABC of a bias towards the ANC and censoring messages, which the broadcaster denied. However, the refusal by the SABC to air these adverts plays into that perception, our correspondents says. After a hotly contested election campaign, South Africans go to the polls on 7 May. It will be the first time that the ANC is contesting a general election without Nelson Mandela, its former leader and South Africa's first democratically elected president who died at the age of 95 in December.